Are you ready to take your visibility game to the next level? If you said, “Yes!”, then you’re in for a treat! Leveraging the power of publicity opportunities for your business can be a game changer. It truly can amplify the exposure of your brand quickly, position you as an expert, and connect you with your audience around the globe. Now in order to look like the professional that you are, a media kit is highly recommended for your unique business. There are various reasons why a media kit is recommended and we’ll discuss those later in this article. But for now, let’s dive in to learning more about what is a media kit. Perhaps you have heard of a media kit before and maybe this is completely new to you. Whichever it is, let me briefly define it for you so that we’re all on the same page. A media kit is simply a page on your website or a PDF document that includes relevant information about your business, its brand, and upcoming events or launches (if applicable). The idea behind a media kit, or also known as a press kit, is that all the information needed for journalists or reporters is in one central place so that they’re able to quickly grab the necessary information they need to do their job. 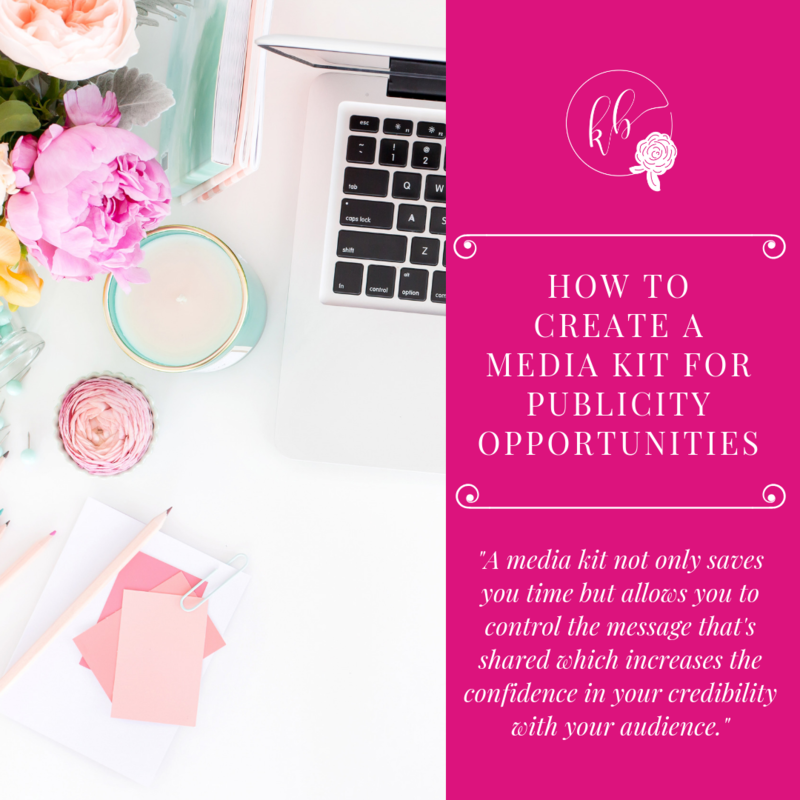 A media kit is important for your business when it’s ready for publicity for many reasons. However, let’s talk about my five favorite benefits to using a media kit for publicity. For starters, a media kit will save you a ton of time in the long run. You will no longer need to gather all the information and play email tag with someone when they need your media information. It’ll all be in one spot which can be updated regularly with the most recent information about your business, an event, or launch. A media kit puts you in control of your message and what will be shared with others. It’ll allow you to have consistency in your brand’s message and present yourself as the way you wish to be seen by your audience. Providing the right information to establish the trust between you and the media is important. As a professional, a media kit can help build your image, even as a newbie. You want people to take you seriously and view you as credible which can be done by utilizing a media kit. A media kit gives potential clients and customers confidence that you are credible business and an expert in your industry. It’ll put the at ease knowing that they know more about your business and that you are able to solve their specific problem(s). By having a media kit, it can attract new qualified leads to your business. The information contained in the media kit can reach your audience in other ways who wouldn’t have otherwise heard about you. A media kit not only saves you time but allows you to control the message that's shared which increases the confidence in your credibility with your audience. Now that you know what a media kit is and its benefits. Let’s discuss why you need a media kit for your business. A media kit provides relevant information to someone in which you wish to partner with for exposure. You are able to use your media kit in various ways but each option falls into two categories: (1) Passive action (2) Proactive action. Passive action is where someone reaches out to you to feature your business. Proactive action is where you present your media kit and an offer to someone else for exposure. Here are a five reasons why a media it would be beneficial for you. As you can see, having a media kit can save you time, showcase your professionalism, and create cohesiveness in your brand’s message for partnerships or with potential clients. A win-win situation in my book! Looking for resources to improve your marketing? Join my F-R-E-E Subscriber Tribe to gain access to my incredible Resource Library that hosts 20+ resources to help you in all areas of your business, including a fill-in-the-blank template crafting the perfect pitch for publicity opportunities. Join the Subscriber Tribe Resource Library today! Are you wondering if your unique business could utilize a media kit? Well, in my professional opinion, I believe that every type of business could use a media kit. Yes, that means a blogger, an author, a speaker, a brick and mortar business, an online business, an affiliate marketer, or even an MLM could use a media kit. The media kit created for each business and its industry will vary but I firmly believe it’s the one resource every business owner should have at their disposal to use. They’re great for announcing a new business or product launch or advertising an event. Alright, we are hustling right along! To wrap up our discussion about media kits, we’re going to get down to the nitty gritty of what to include in your media kit. As I mentioned, each brand’s media kit will be different for their unique business. Therefore, keep that in mind as your create or update your media kit. The following is what I recommend to include in your media kit. However, you may include what you see fit for your media kit. Use either your logo or a header image to brand your media kit. Provide a letter of introduction, a pitch letter, that shares why they should work with you, what’s included in the press kit, and your contact information. Provide an updated press release, recent publications or articles, and links to previous interviews, speeches, or media coverage. Provide short professional bio highlighting your accolades. Provide a professional headshot of yourself. No selfies! Tell your potential clients or partners more about your business and what you’re about. Provide a detailed description of your target audience. Share how you can be reached for publicity opportunities or for hire. Provide your social media handles, the number of followers, and website traffic. Provide testimonials from past clients, advertisers, or both. Provide the ways in which you wish to offer in partnership with other brands for a mutual benefit. Provide a sample listing of questions that could be used for an interview. Share specific information about upcoming events or promotions that are relevant. Provide your current rates if you plan to create a media kit for potential clients. Share relevant photos to showcase what your brand is about. Showcase samples of your best work for prospective clients and partners. Last but not least, when you are preparing to send out your media kit, please do not send it as a mass email with a generic message. Take your time, do your research, and send a customized email or letter to the appropriate person. You’ll stand out and won’t annoy the people you are reaching out to for partnership. I’m excited to hear how this has helped you create a unique media kit for your business. If you would like to share with me your final or updated media kit, please email it to kayla@kaylabrissi.com. I’d love to see it! Share in the comments: What was your biggest takeaway from the article?